When a natural disaster hits there isn't a lot of time to gather supplies. Thankfully, you likely have an invaluable technological multitool in your pocket right now: your smartphone. Here are some apps you should have ready just in case. 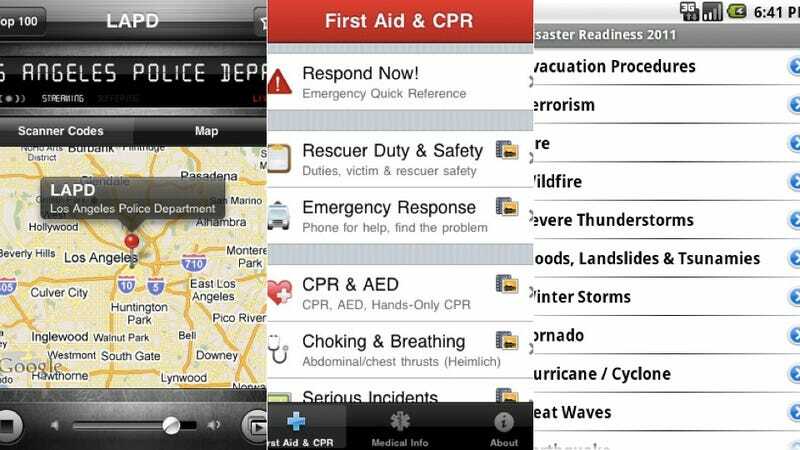 Pocket First Aid & CPR, iPhone & Android: The official first aid app of the American Heart Association has extensive guides, many including video, covering how to administer CPR, how to treat various injuries, and how to dress burns, bruises, cuts and other types of wounds. Dan Wooley, an aid worker trapped under rubble during the Haiti earthquake, used this app to find out how to treat his compound fracture; if that's not a a convincing enough testimonial, I don't know what is. $4. Emergency Radio (iPhone), Scanner Radio Pro (Android): In the wake of a disaster, you want to have reliable information. Emergency Radio (iPhone) and Radio Scanner Pro (Android) give you access to a huge database of police, coast guard, fire, EMS, and transit radio across the country. $1, $3 respectively. If you have found other apps to help disaster-proof your life (as best as you can), let us know in the comments..